An outpost was set up by the Hessians at a cooper shop on Pennington Road about one mile north-west of Trenton. 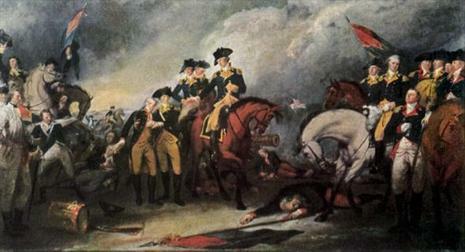 George Washington himself led the assault, riding in front of his soldiers. The Hessian commander of the outpost, Lieutenant Andreas von Wiederholdt, came out of the shop to get some fresh air, and an American fired at him. Wiederholdt shouted "The Enemy!" and other Hessians came out. The Americans fired three volleys at them and the Hessians returned one of their own. Washington ordered Edward Hand's Pennsylvania Riflemen and a battalion of German-speaking infantry to block the road that led to Princeton, and they did attack the Hessian outpost there. Wiederholdt soon realized it was more than just a raiding party, and he saw the other Hessians retreating from the outpost on the Princeton Road, and decided to do the same. Both of the Hessian detachments led an organized retreat, firing as they fell back. They fell back to the high ground at the north end of Trenton, where they were joined by a duty company from the Lossberg Regiment. They engaged the Americans, retreating slowly, keeping up continuous fire and using houses and other buildings for cover. Once in Trenton, they began to receive support from other Hessian guard companies on the outskirts of the town. 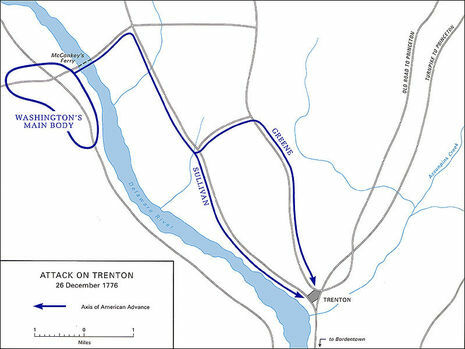 Another guard company nearer to the Delaware River rushed east to their aid, leaving open the River Road into Trenton. 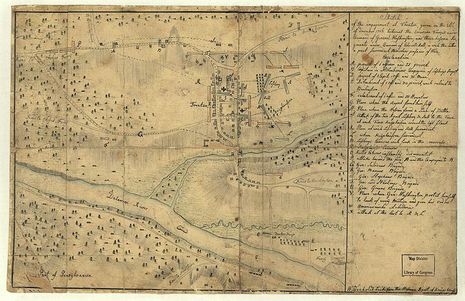 Washington ordered that the escape route to Princeton be cut off, sending infantry in battle formation to block it off, while artillery formed at the head of King and Queen streets. General John Sullivan, leading the southern American column entered Trenton on the abandoned river road, and blocked the only crossing over the Assunpink Creek. This was the only way out of Trenton to the south, and he hoped to cut off the Hessian escape. Sullivan briefly held up his advance to order to make sure that Greene's division had time to drive the Hessians from their outposts in the north. Soon after, they continued their advance, attacking the Hermitage, home of Philemon Dickinson, where 50 Jägers under the command of Lieutenant von Grothausen were stationed. Lieutenant von Grothausen brought 12 of his Jägers into action against the advanced guard, but had only advanced a few hundred yards when he saw a column of Americans advancing to the Hermitage. He pulled back to the Hessian barracks, and was joined by the rest of the Jägers, who had evacuated the Hermitage. After one volley, they turned and ran, some trying to swim across the creek, while others escaped over the bridge, which had not yet been cut off. The 20 British Dragoons present also fled at this time. As Greene and Sullivan's columns pushed into the town, Washington moved to high ground north of King and Queens streets so he could see the action, and direct his troops. At this time, artillery from the other side of the Delaware River came into action, devastating the Hessian positions. The alarm soon sounded and the three Hessian regiments began to prepare for battle. The Rall regiment formed on lower King Street along with the Lossberg Regiment, while the Knyphausen Regiment formed at the lower end of Queen Street. Lieutenant Piel, Rall's brigade adjutant, finally awoke his commander, who found that the rebels had taken the "V" of the main streets of the town where earlier that month the engineers would have constructed the redoubt. Rall ordered his own regiment to form up at the lower end of King Street, the Lossberg regiment to prepare for an advance up Queen Street, and the Knyphausen regiment to stand by as a reserve for Rall's advance up King Street. The American cannon that had been stationed at the head of the two main streets soon came into action. In reply, Rall directed his regiment, supported by a few companies of the Lossberg regiment, to clear the guns. The Hessians formed into their ranks, and began to advance up the street, but their formations were quickly broken by the Americans guns, and fire from Mercer's men who had taken the houses on the left side of the street. Their ranks broke, and the Hessians fled. Rall then ordered two three-pound cannon into action. The cannon managed to get off six rounds each, but within just a few minutes, half of the Hessians manning their guns were killed by the American cannon. The remaining men fled to cover behind houses and fences, and their cannon were taken by the Americans. At once following the capture on the cannon, men under the command of George Weedon advanced down King Street. On Queen Street, all Hessian attempts to advance up the street by the Lossberg and the Rall regiments were repulsed by guns under the command of Thomas Forrest. Two more Hessian guns were silenced, after they had only fired four rounds each. One of Forrest's Howitzers was put out of action with a broken axle. At this point, the Knyphausen Regiment became separated from the Lossberg and the Rall Regiments. The Lossberg and the Rall fell back to a field outside the town, taking heavy losses from grapeshot and musket fire. In the southern part of the town, under the command of Sullivan, the Americans began to overwhelm the Hessians. John Stark led a bayonet charge at the Knyphausen regiment, breaking down most resistance as most of the Hessian weapons could not fire, and Sullivan personally led a column of men to block off any more troops from escaping across the creek. The Hessians in the field attempted to reorganize, and make one last attempt to retake the town so they could make a breakout. Rall decided to attack the American flank on the heights north of the town. Rall yelled "Forward! Advance! Advance! ", and the Hessians began to move, with the brigade's band playing fifes, bugles and drums to help the Hessians spirit. Washington, who was still on the high ground, saw the Hessians approaching the American flank and moved his troops so they could be in battle formation where the Hessians approached. The two Hessian Regiments began marched toward King Street, but were caught in American fire that came at them in three directions. Some Americans had taken up positions inside houses, making it difficult to be hit. Even some civilians joined the fight against the Hessians. Despite this, they continued to push, recapturing their cannon. Knox, at the head of King Street, saw that the Hessians had retaken the cannon and ordered that they be taken. Six men ran, and after a brief struggle, seized the cannon, turning them on the Hessians. Most of the Hessians were unable to fire their guns and the attack stalled. The Hessians formations broke, and they began to scatter. At this point, Rall was mortally wounded. Washington came down from the high ground and led his troops, yelling, "March on, my brave fellows, after me!" Most of the Hessians retreated into an orchard, with the Americans in close pursuit, and they quickly surrounded them. A German-speaking American offered the Hessians surrender terms, and they agreed. The remains of the Knyphausen Regiment had been ordered to join Rall, but due to a misunderstanding they marched in the opposite direction. They tried to escape across the bridge, but found it had been taken. The Americans quickly swept in, and a Hessian attempt to break through their lines failed. They were cut off from the bridge, surrounded by Sullivan's men, and forced to surrender. The regiment surrendered just minutes after the rest of the brigade. On December 26, at 3:00 A.M. the crossing was complete but the column was not ready to march until 4:00 A.M., well behind schedule. Even with intelligence from Loyalists and American deserters, having told him the day and hour of the attack, Rall did not know how large the American attacking force would be. He figured that it would be nothing more than small hit-and-run patrol actions to which he had become accustomed and indifferent. At 4:00 A.M., about 4 miles from their crossing at Birmingham, Washington's force split into two columns. Greene, along with Washington, led one column onto the Pennington Road to attack the Hessian garrison from the north. Sullivan led the second column continued on the river road so it could attack the Hessian garrison from the west. By 6:00 A.M., the troops were miserable. Sullivan sent word that the men's muskets would not fire due to being exposed to the storm all night. Washington sent word back for the men to use their bayonets instead. At the Hessian garrison, Rall had passed out and was sound asleep along with most of his 1,200 man force, which was divided into 3 regiments: under himself, Col. Thaddeus Knyphausen, and Lossberg. Because of the severe snowstorm, Maj. Dechow decided not to send out the normal predawn patrol to sweep the area for signs of the Americans. Though the storm cause extreme misery for the troops, it allowed them to approach undetected. At 8:00 A.M., Washington's party asked a man that was chopping wood where the Hessian sentries were, just outside of Trenton. He pointed to a nearby house. A 20-man outpost of Lt. Wiederhold saw the Americans emerge from the woods about 1/2 mile from the northern end of Trenton, on the Pennington Road. The outpost waited until the Americans were within range, then fired an ineffective volley at them. They quickly dropped back onto their main company position, some 400 yards closer to the town. About 3 minutes after this engagement, Sullivan's advance guard flushed and routed a 50-man Hessian outpost stationed on the river road, about 1/2 mile from Trenton. Moving quickly and driving in the pickets, both columns move in on Trenton. The Hessians were caught completely by surprise and were unprepared. They turned out quickly and formed up, but their attempts to attack to the north were hampered by the flanking fire from Washington's western column and artillery. The Americans positioned 2 cannon, commanded by Capts. Alexander Hamilton and Thomas Forrest, on a rise that guarded the two main routes out of town, King Street and Queen Street. The Hessians tried to bring 4 guns into action, but the American fire kept them silent. Hamilton's men charged down the streets after the British guns. Knyphausen's regiment was separated from the other 2 regiments and driven back through the southern end of Trenton by Sullivan's column. Many of the Hessians were able to escape to the south across Assumpink Creek, where Ewing's troops were supposed to have been located. Rall and Von Lossberg's regiments were forced out of town and formed in an apple orchard at the southeast corner of town. Rall ordered a counterattack back into town, trying to force a hole to the road to Princeton. A few seconds later, Rall was hit and mortally wounded while on his horse and fell off. The Hessians had wet guns from the storm, and had a hard time firing them. 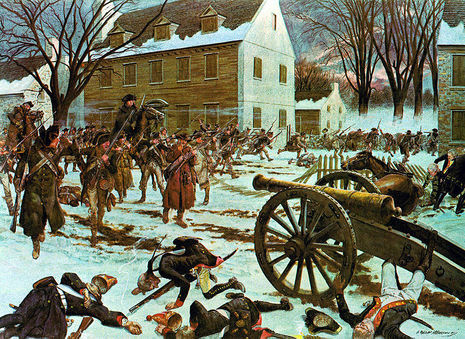 When the Hessians arrived back into Trenton's streets, the American troops, joined by some civilians from the town, fired at them from buildings and from behind trees and fences, causing confusion. At the same time, the American cannons broke up any formations and the Hessian resistance faltered. They retreated back to the apple orchard and tried to escape across the Assumpink Creek. There, they found the bridge blocked and the fords upstream covered by the Americans. They were soon surrounded by the fast moving Americans and left them with no choice but to surrender. The remnants of the Knyphausen Regiment were making for Bordentown, but they were slowed down when they tried to haul their cannon through boggy ground. They soon found themselves surrounded by Sullivan's men and they also were forced to surrender. At 9:30 A.M., the fighting finally died down. The battle had been an overwhelming victory for Washington, lasting only 90 minutes and fought through the 100 houses of Trenton. The Americans captured 1,000 arms, several cannon and ammunition, and some much needed supplies. About 600 Hessians, most of which had been stationed on the south side of the Creek, managed to escape. This made Washington's plan to continue towards Princeton and Brunswick out of the question. With a large body of prisoners to evacuate, British reinforcements nearby, his own troops exhausted, and no adequate supply from across the river, Washington had no choice but to withdraw. By noon, Washington's force had moved to recross the Delaware back into Pennsylvania, taking their prisoners and captured supplies with them. This battle gave the Continental Congress a new confidence because it proved American forces could defeat regulars. It also increased the re-enlistments in the Continental Army forces. The Americans had now proved themselves against a disciplined European army and the fear the Hessians inspired earlier that year in New York was broken. As Captain Johann Ewald [of the Jägers], who was with von Donop in Mt Holly at the time of the attack, said of the Americans later, "We must now give them the honor of fortifications". Only two Americans were wounded, both during the Americans' rush to capture Hessian artillery before they could be used in the battle. These wounded were officers: Captain William Washington (the General's cousin), who was badly wounded in both hands, and young Lieutenant James Monroe, the future President of the United States. Monroe was carried from the field bleeding badly after he was struck in the left shoulder by a musket ball, which severed an artery. Doctor John Riker clamped the artery, keeping him from bleeding to death. Washington had turned the tide, chasing the British forces from the Delaware River and putting them on the defensive, if only for a few days. When the Continental Congress heard of Washington's victory at Trenton, they had renewed confidence in their Commander-in-Chief and it bolstered enlistments and re-enlistments for 1777.